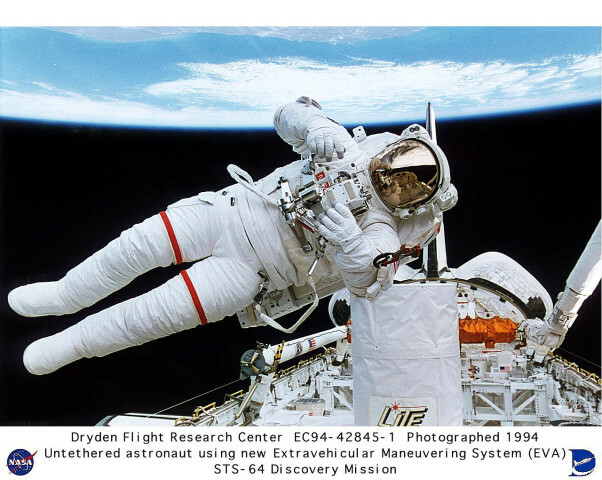 The manned maneuvering unit is a one-man propulsion backpack that snaps onto the back of the space suit's portable life-support system. The MMU allows the astronaut to work outside without a tether and is able to move as far as 300 feet from the orbiter. It is designed to provide EVA support for as much as six hours at a time. The MMU weighs 255 pounds and is propelled by nitrogen gas fed to twenty-four thruster jets. Two pressurized nitrogen tanks can be filled from the orbiter's on-board supply. All systems on the MMU are dual redundant (if one system fails, the second system can take over completely). This photo is the newest form of the manned maneuvering unit. The older models were not as flexible and bulkier than the new EVA. The older MMU had two hand controllers on the ends of the MMU's armrests.